Watching a Lake Ontario sunset. Nikon D700/Tokina 11-16mm, 1/15s, f/22, ISO 1600, EV 0, 16mm focal length. 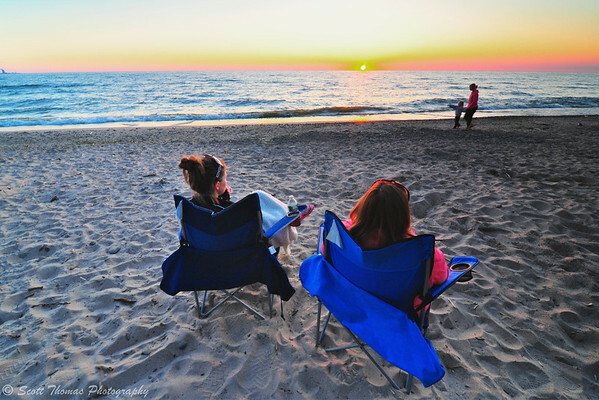 After hours of fun on the water or on the beaches of Lake Ontario, watching the Sun set over the beautiful lake is a good way to end the day. Beautiful sunset over the 'beautiful lake' of Lake Ontario. Nikon D700/Tokina 11-16mm, 1/500s, f/4.5, ISO 200, EV -0.3, 16mm focal length, 2-stop Graduated Neutral Density filter. I wanted to freeze the water so choose a fast shutter speed of 1/500th of a second and kept the ISO at 200 for best quality. The low angle of the Sun created strong back lighting on the waves. It is slightly underexposed by about a 1/3 stop using the EV compensation button to bring out more color. That’s an old landscape photographer trick. 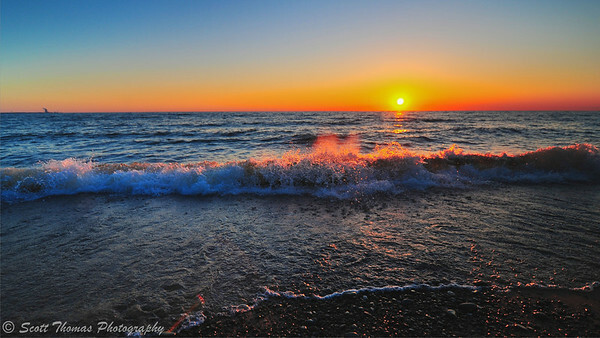 This entry was posted in Nature, People, Photography and tagged backlighting, beach, chairs, Lake Ontario, new york, sunset, surf, tokina 11-16mm, water, waves. Bookmark the permalink. You’ve set the bar awfully high, Scott. After the week you’ve had we’re going to have to go some to get people to give Lake Michigan a look! Just beautiful. Wish I was there! I was there last night again. Always cooler by a lake. Amazing photos of a precious lake, well done!! I have seen so many sunsets. I have shot quite a few myself. I have even considered posting some, but hesitated because I wouldn’t present just another photographic cliche. But your sundowns are not chliches. They are BEAUTIFUL! And special! Bravo Scott. Hard to avoid cliches with sunsets. I try to get a strong foreground subject in my sunsets whenever possible. Without the light on the wave, this would have been just another beautiful sunset. In fact, I took many of those that evening which I later discarded.